As the rezoning request of the Amherst Street corridor last week highlighted, Winchester’s local historic district and National Register district currently have different boundaries. What does this mean for property owners? Currently, the Amherst corridor has the regulation of the local Board of Architectural Review, but none of the financial incentives available to other properties that fall within both the local and national districts. Dave Shore, a Planning Commission member who served on the Historic District committee, said he thought the panel’s intent was to seek expansion of the national district to mirror the local district. That would provide economic incentives for property owners to improve buildings currently subject to BAR governance but without the fiscal advantages of being in the national district. The hope is that the incongruities noted in the survey will drive the redrawing of the city’s historic district, potentially contracting the district from “non-contributing” resources and expanding to include contributing resources currently ineligible for tax benefits. Proposed plans to remove the Historic District overlay from several properties along the Amherst Street corridor were not recommended to move forward at yesterday’s Planning Commission meeting.
. . . Chairman Nate Adams objected to removing the property from the local historic district specifically to advance a project. He said other businesses have obtained BAR approval to build in the district, and he was concerned that others might expect similar consideration in the future. ‘I’m not sure why we should carve out an exception here,’ said Adams. Read the full article at The Winchester Star online (login required). Last week, hundreds of preservationists visited decision makers on Capitol Hill in an effort to promote good preservation policy and restore funding that was cut from key preservation programs. The message was simple: Preservation equals Jobs. The PHW Blog is receiving some behind the scenes tweaks. Content and format will not change dramatically, but it will be easier for us to update. Another post will announce when the new blog goes live; any changes to the RSS feed will be announced at that time. Please note: The quarterly meeting has been postponed because of the snow. Information will be posted concerning the new time when it becomes available. The Northern Shenandoah Valley Branch of Preservation Virginia will hold its next quarterly meeting on Sunday, February 21, 2010 at 2:00 p.m. at the historic Springsbury Farm in Clarke County, Virginia. Free and open to the public, the meeting will offer a rare opportunity to tour this historic former plantation along the Shenandoah River. Following a short business meeting, Barbara Shea, president of Casey Trees Farm, will provide a tour of the property and light refreshments will be served. Directions to Springsbury Farm from downtown Berryville: Take East Main Street to John Enders Boulevard. Turn right onto John Enders Boulevard. Turn left onto Springsbury Farm Road. Continue on Springsbury Farm Road to its end at Springsbury Lane. Go down the hill. The Trooper House, where the meeting will take place, will be on the left, before the barns. Address: 543 Springsbury Lane, Berryville. Charles Broadway Rouss Day will be celebrated this year on February 13. In the case of inclement weather, the events will be rescheduled for February 20. The PHW Office will be closed today due to inclement weather. The Revolving Fund property reviews will also carry over to next week, although the majority are completed. Thanks to all of our supporters during this season of giving, whether you are members, sponsors, tour-goers, volunteers, or concerned citizens. 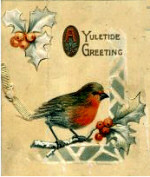 We value all your input and are looking forward to serving your preservation needs in 2010! The office will be closed on Christmas Day. As a reminder, the Revolving Fund property reviews will begin on the 28th, weather permitting. The office will also close for New Year’s Day.